How would you like your foldable smartphone to fold? Huawei P30 Pro Camera Hands-on: Rewriting all the rules? Samsung Galaxy Buds Hands-on: Third time’s a charm? What was FairPlay Canada really trying to accomplish? SyrupCast Podcast Ep. 195: What does the 600Mhz spectrum auction mean? SyrupCast Podcast Ep. 192: What is spectrum and how is it used? 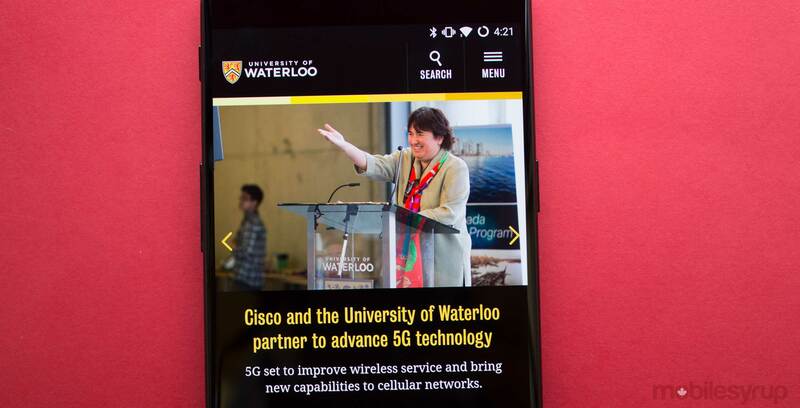 Cisco Canada has pledged $1 million CAD to the University of Waterloo over the next five years in order to advance research on the fifth generation of wireless networks. With 5G looming on the horizon, Cisco is investing in the university to create a position called the Cisco Research Chair in 5G Systems. The position will spearhead research and investigate the opportunities made possible by 5G networks, along with testing innovations for Cisco’s wireless networks. The first person to take on this role is Catherine Rosenberg, professor in electrical and computer engineering at the University of Waterloo. “We are generating increasing amounts of wireless traffic as our applications grow more bandwidth hungry, 5G will deliver better service to fixed and highly mobile users and scale to provide connectivity to millions of things. I believe this chair is an opportunity to generate exciting collaborative and multidisciplinary research on 5G,” said Rosenberg in a statement published on the school’s Waterloo Stories blog.